Today, I'm writing about the costume for The Wicked Witch of the West in The Wizard of Oz (1939). 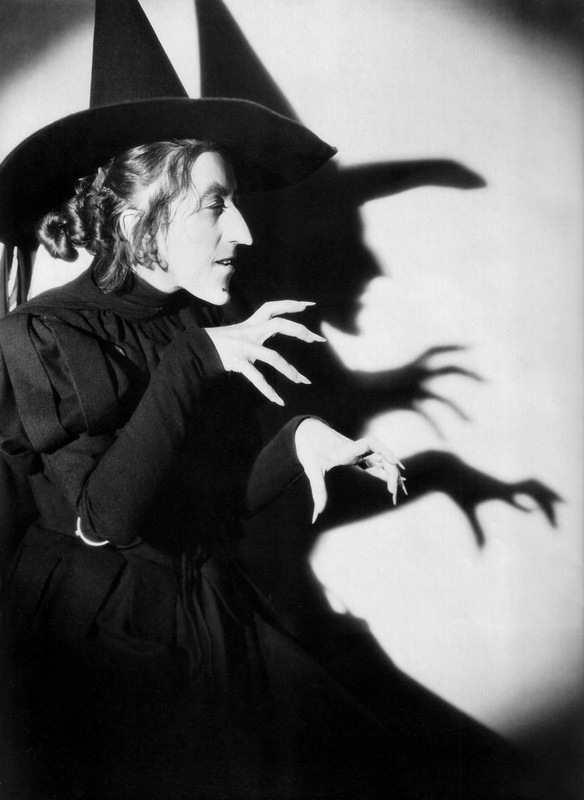 Here's Margaret Hamilton, who portrayed the Witch, menacing Dorothy Gale (Judy Garland). 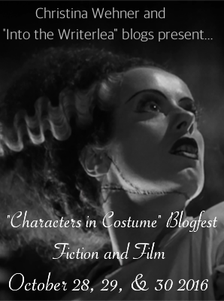 This article is part of the Characters in Costume Blogfest: Fiction and Film hosted by Christina Wehner and Into the Writer Lea. If you are passing out candy this Halloween, chances are you will see a child dressed like the Wicked Witch of the West in MGM's classic musical, The Wizard of Oz (1939). The makeup and costume for the legendary villain played by Margaret Hamilton has become the defining pop culture image for the witch, but Oz producers tried out several variations of the character before settling on the famous black wardrobe and green makeup. In L. Frank Baum's 1900 children's novel, The Wonderful Wizard of Oz, The Wicked Witch of the West is one of four villains -- the other three are the Wicked Witch of the East, the Wicked Witch of the South, and the Wicked Witch of the North -- who menace Kansas farm girl Dorothy Gale. Baum's Witch has some characteristics that were used in the movie such as a fear of water and a band of winged monkeys, but she is mostly a cross between a fairy tale crone and 19th century eccentric who ruleses Oz with an eyepatch and an umbrella. In the 1910 movie version of Oz, the character portrayed by Winifred Greenwood is quite similar to Baum's description, but the 1925 silent version eliminates the Witch entirely in favor of a villainous Oz politician, Prime Minister Kruel (Josef Swickard). Screenwriters Noel Langley, Florence Ryerson, and Edgar Allan Woolf made the Wicked Witch of the West the primary villain for MGM's version of Oz, but, at first, producer Mervyn LeRoy had a very different characterization in mind than Baum's wizened old crone. LeRoy directed the wildly successful costume drama, Anthony Adverse (1936), which won actress Gale Sondergaard the first-ever best supporting actress Academy Award for her portrayal of a glamorous social climber. LeRoy, wanted to capitalize on Sondergaard's screen allure by portraying the Witch as a fairy tale femme fatale who was modeled on the evil Queen in Walt Disney's Snow White and the Seven Dwarfs (1938). Sondergaard did several costume tests for a glam Witch dressed in a body-hugging black sequined costume, but MGM's honchos were dissatisfied. They wanted a more traditional witch -- they felt the character would have more kid appeal at the box office -- so LeRoy uglied up Sondergaard for a series of wardrobe tests that caused the actress to immediately resign from the production. A wardrobe test for Gale Sondergaard as a glamourous Wicked Witch of the West. LeRoy next turned to reliable character actress Margaret Hamilton. The Ohio native was making a decent living appearing in small parts in movies like Nothing Sacred (1937) and Saratoga (1937), but LeRoy thought her distinctive looks and voice would make her perfect for the role of both the Witch and her Kansas counterpart Almira Gulch. Hamilton, who was never sensitive about her appearance -- she always liked to say "my face has given me lots of work" -- jumped at the chance to play a role from her favorite childhood book. Hamilton began working on Oz in October 1938, according to her introduction to The Making of The Wizard of Oz by Aljean Harmetz. She went through a series of grueling tests for everything from the prosthetic nose, chin, and nails she wore as the Witch to the length of her black costume (Hamilton had to keep on insisting that it be short enough so that she wouldn't trip over it during film). Several hairstyles were also considered before they settled on a somewhat elaborate chignon, mostly because it held the Witch's peaked hat in place. The Witch's iconic green makeup, which doesn't appear anywhere in Baum's novel, was chosen because the hypersensitive Technicolor cameras didn't photograph Hamilton's natural skin tone well against her stark black wardrobe. Ironically, green skin would become the character trait most associated with the Witch, and it is has launched thousands of pop culture references from the book and Broadway musical Wicked to the 2013 movie Oz the Great and Powerful. When Oz premiered in September 1939, Hamilton's iconic portrayal of the Witch garnered a lot of press and critical attention. One reviewer, who is quoted in The Wizard of Oz: The Official 75th Anniversary Companion by Jay Scarfone and William Stillman, warned parents to think carefully before taking their children to see the movie, and Mrs. T.G. Winter of the Motion Picture Producers and Distributors of America stated that "the Wicked Witch is a bit scary for ultra-nervous children." 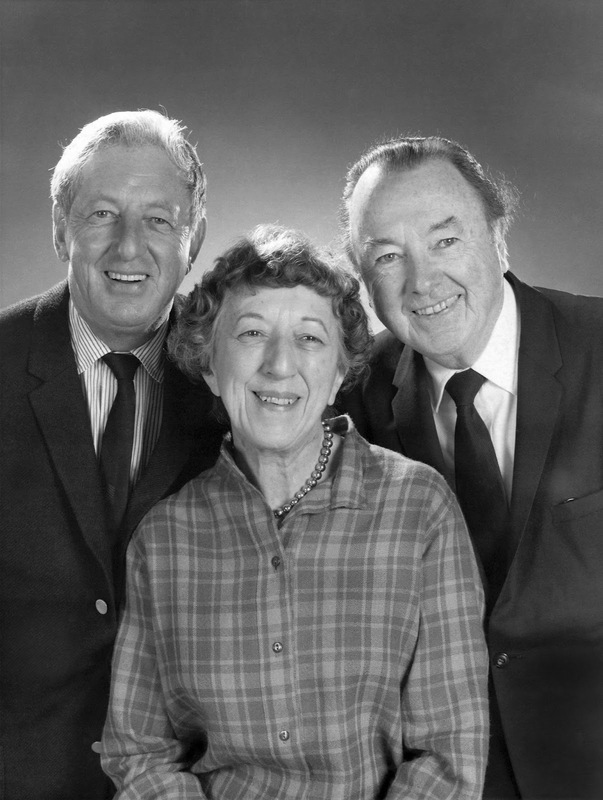 Ray Bolger, Margaret Hamilton, and Jack Haley at a 1970 Oz reunion. For her own part, Hamilton had a great time playing the Witch. "It's not a particulary difficult role to play," she said in an interview. "You just wring your hands and roles your eyes and rant and rave and shriek." Hamilton reprised her Wicked Witch characterization in everything from the Abbott and Costello comedy Comin' Round the Mountain (1951) to Sesame Street, and, after Oz became a TV staple in the 1960s and 1970s, she happily posed for photographs and gave interviews about her time as the Wicked Witch. I'll leave you with this clip about Hamilton and the Wicked Witch from the documentary, The Wonderful Wizard of Oz: 50 Years of Magic. 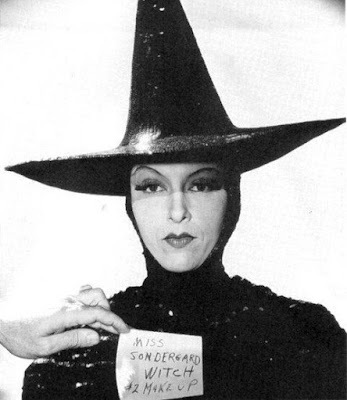 That would have been interesting to see Gale Sondergaard as the Wicked Witch! I've always been a fan of her, but it's hard to imagine anyone other than Margaret Hamilton. 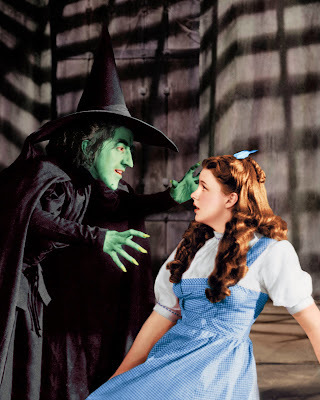 I even saw Margaret Hamilton in my mind when I read the book (with green skin). :) Margaret Hamilton sounds like a neat lady - someone it would have been a pleasure to meet, despite her most famous role. But that is so fascinating how her green skin - something chosen solely for how it would look on the camera - has become such an iconic part of the Wicked Witch. Thanks so much for joining and for this great exploration of the wicked witch and her costume! Yes, somehow I don't think the witch would have been so memorable if she wasn't green. Great post! I had no idea there even were earlier versions of the film, so I learned a lot! Have you seen them? It's impossible to imagine her without the green skin - amazing that it was really just for technical reasons in the beginning. Thus are legends born! Both of the silent versions are easily available online, but I must confess that I've only seen parts of them. They just didn't hold my attention. Fascinating piece on such an iconic role! I found it very interesting to learn why they used the green face make up and that it wasn't part of Baum's description. Now anytime you think of a witch, you think of a green face! I'm glad they went with Hamilton for the role. It would have been very different had it been Sondergaard. The witch is funny. Too funny for me. I'm German and I wanna be from Ohio,Cleveland. I have her costume.